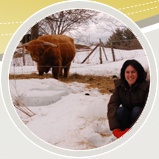 Rebecca's research interests lie at the intersection of science, nature and economy. Her dissertation explores the significance of “native” British breeds of livestock the late-nineteenth-century when livestock and landscapes were literally and figuratively reshaped across the empire to suit the tastes of British consumers. As pastures were cleared and carcasses fattened, some breeds thrived while others declined precipitously. Alarmed at the potential loss of cultural “tradition” and genetic potential embodied in endangered breeds, British enthusiasts have led efforts to save them from extinction. From localized roots in England across the empire, she traces the notion of breed up to the present when conservation efforts have expanded it to include not only physiology and inheritance, but time and tradition, turning beasts of burden simultaneously into living archives and future potential.